Clean up your stage with the PRO Mixer Distro. The PRO Mixer Distro allows the same 8-port Network Card that goes in the Hear Back PRO Hub to be used stand-alone. A durable anodized aluminum housing protects the Hear Back PRO Network Card and allows it to stand up to years of abuse in the studio or on the road. The Distro also uses the same 4-pin XLR power connector used by the Hear Back PRO Hub. This allows the same standard Hear Back PRO power supply to be used with the Distro. 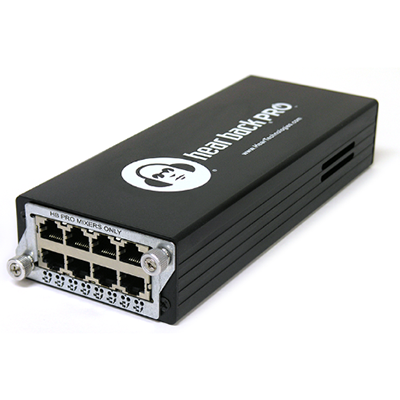 The user can connect another Distro with a ninth RJ45 Ethernet connector (BUS IN) or to the HBUS output or Mixer network card on a Hear Back PRO Hub. Allows a single Cat6 cable to be run from the Hear Back PRO Hub to the stage/studio where the PRO Mixer Distro can be placed where needed. PRO Mixer Distro (PRONET) includes enclosure with network card loaded and power supply. PRO Mixer Distro Box (PROBB) is an empty box with power supply so that you can remove your existing network card from your Hub and insert it (no network card included). © 2018 Hear Technologies. All Rights Rerserved.